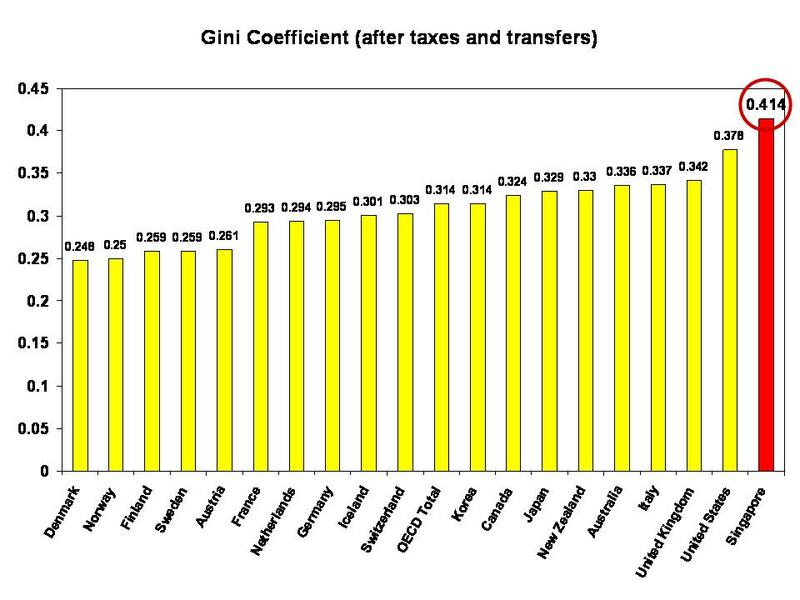 According to Today, “some countries compute their Gini coefficients based on … the “square root scale” (used in some OECD reports), which “take into account that households may enjoy economies of scale when sharing resources among household members”. According to the current way, “Singapore’s Gini coefficient of 0.478 last year, before accounting for Government transfers and taxes, is on a per-household-member basis.” According to the “modified OECD scale” Singapore’s Gini coefficient is “0.435 if the square root scale is used” and would be 0.414 after Government transfers and taxes. All fine and well, right? If Singapore’s Gini coefficient is adjusted downwards based on a different scale, it looks like Singapore’s income inequality is actually not that high, right? Not really. What the Key Household Income Trends 2012 report doesn’t tell you that even if we use OECD’s scale to compute Singapore’s Gini coefficient, Singapore still has the highest income inequality, as compared to all the other developed economies in the OECD. I had looked at the OECD Stats Extract and obtained the following statistics (of selected countries), in the chart below. 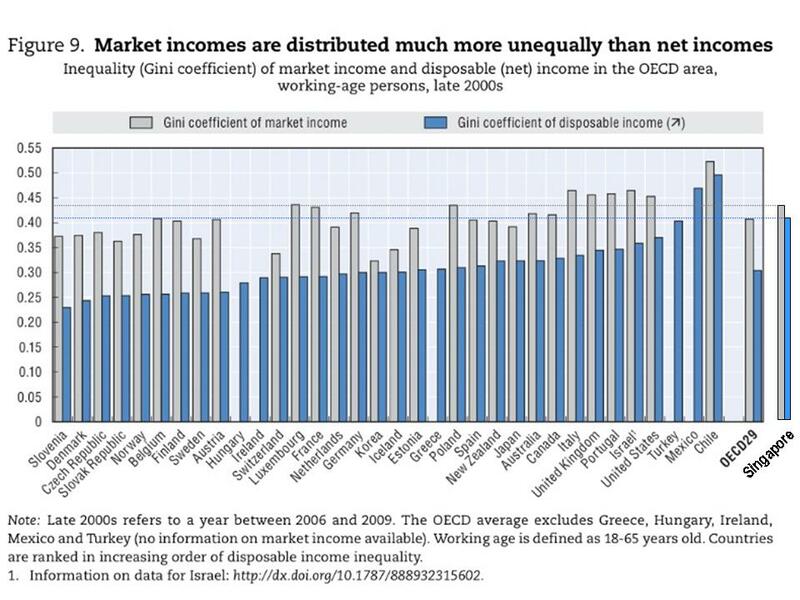 You can see that, clearly, Singapore’s income inequality is significantly higher than the other economically-developed countries in OCED. 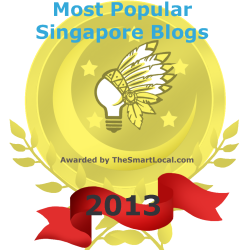 I had superimposed Singapore’s statistics into the chart below. You can see that even before government transfers and taxes, Singapore’s Gini coefficient is already much higher than most of the economically developed countries. Whereas all the countries in this chart were able to reduce their income inequalities significantly, with the exception of South Korea, Singapore wasn’t able to do so, or rather, the government isn’t willing to. South Korea did not adjust income inequality downwards but its income inequality is comparatively much lower, to begin with. The often put out argument by the government is that Singapore’s taxes are low, and thus we are not able to afford to provide high social welfare spending. However, is this true? The recent protest against the population white paper needs to be understood in this light. Do Singaporeans understand what the long term implications are to sound economic policies for Singapore? I am sure we do, as our parents and grandparents for a large part of the nearly 50 years of Singapore’s modern day history. However, as the report had pointed out, the rising income and social inequality, fuelled as well by a flawed practice of meritocracy which favours the well-heeled over the poor, has resulted in “social resentment”, and gradually, “political instability”, as can be seen. Thus discussion about xenophobia has also arisen out of this context of being “protectionist” – the people are reacting to their inner insecurities about their own future, and unfortunately have misdirected their anger onto foreigners, even as they should direct it to the government and their flawed policies. 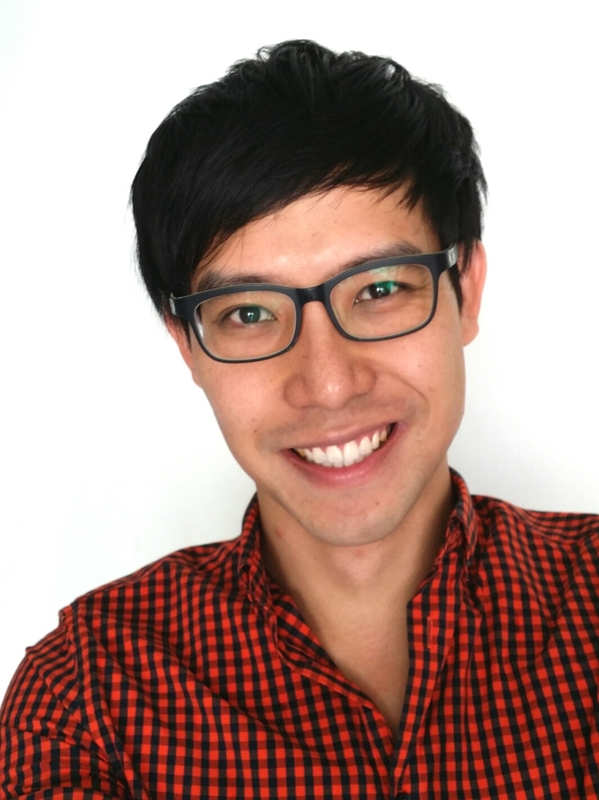 Because of government policies which have favoured the rich in and who have come to Singapore, “while a small group of winners is getting richer and richer”, this has caused Singaporeans to feel that “they are losing out” and thus they are starting to believe that Singapore can “no longer support open trade and free markets”. And thus Singaporeans are disagreeing with the 6.9 million population projection figure, because of fears of how an open trade and free market economic system will do to their already worsening livelihood. However, in Singapore, instead of enabling our older workers, women and migrants to acquire new jobs that enable them to escape poverty, they are forced to work on low wages. This has the resultant effect of depressing the wages of Singaporeans who work in jobs which pay similarly, and has thus trap a group of Singaporeans in a state of chronic poverty. There are abour 300,000 Singaporeans who earn less than $1,000 a month and about 450,000 who earn less than $1,500. We often hear of age discrimination where elderly workers are not employed when employers find out about their age or where mothers have their employment terminated because of their pregnancies. Employers also pay migrants low wages because migrants have very low bargaining power. Because of the low pay that employers give to them, this results in Singaporeans’ wages being pushed downwards, which means that the pay of the lower income workers are not commensurate to the cost of living in Singapore. The clear solution is to ensure that Singapore implements a minimum wage law which protects these marginalised groups from earning unequal wages. It also means for the government and businesses to have a fundamental re-understanding of how these supposed ‘low-skilled’ industries can be restructured, so that with technological investment, these occupations can become more ‘high-skilled’ and the workers can earn higher wages. However, the government currently does not believe in investing in these industries and thus this group of people will continue to be disadvantaged by the system and be trapped in chronic poverty. 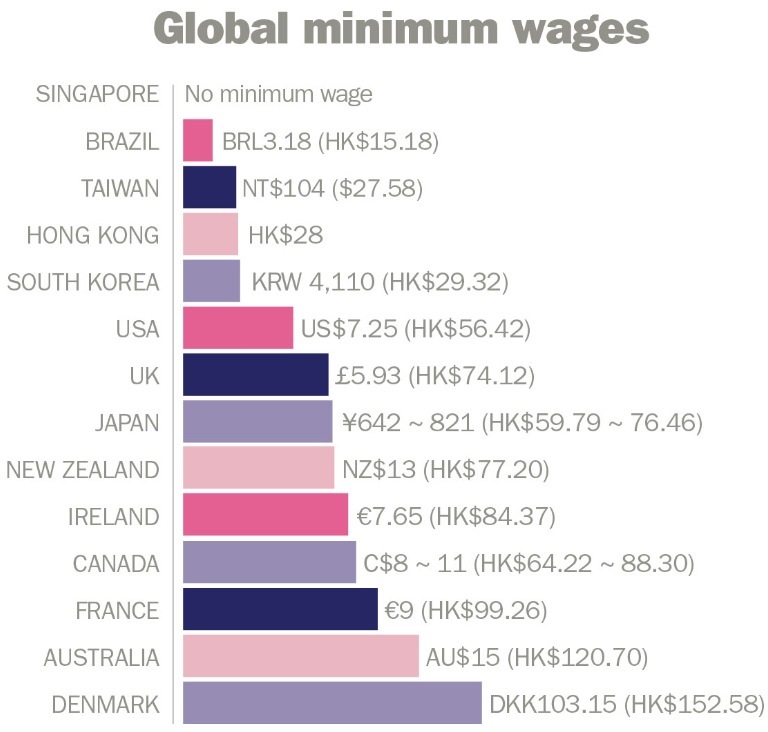 As can be seen in the chart below, Singapore is the only country among the developed Asian economies which does not have a minimum wage law, to date. In the latest Key Household Income Trends 2012 report, the government decided to use new scales to compute the Gini coefficient, because they want Singaporeans to think that the income inequality in Singapore isn’t as bad as it seems, or even as we feel. The fact is that with the same amount of money, the people feel that they can buy less. They feel squeezed. Yet, the government had wanted to put out a preposterous news article to try to confuse Singaporeans into thinking that the income and social inequality isn’t as bad as people think. How irresponsible! When you look at the other countries, these countries have much lower income inequalities, even before government taxes and transfers. Not only that, the government steps in further to further reduce the income inequalities significantly in many of these countries. Yet, our government has chosen to take a back seat and keep purporting about how their hands are tied because of the low taxes that the government is collecting. In 2011, our personal income tax constitute only 13% of the revenue. The government has many other diversified funding sources, also through our CPF monies which they use for investment which accumulates high interests which are not channelled back. The government also earns substantial monies through their investments through Temasek Holdings and GIC. Is there more the government can do, even with their current state of finances, for the people? Certainly. The question now is, if this government willing? It is of no use and simply quite ridiculous to change a numerical statistic to try to make believe to people that our income inequality isn’t that bad, by whitewashing what the fact is, obviously. Instead of fudging the statistics, the government should instead start enacting policies, such as a minimum wage law and to channel more funding into our healthcare bills, where the government already forks out the lowest proportionate expenditure, as compared to other economically-developed countries. This is the very least this government can do, or lose their already very damaging moral integrity, if there is any. you need to measure weight. to embrace wholly the Internet will be the auto industry. The registry consist of diverse files and folders which differ in name and location depending on your version of Windows. of items to the post office and have the clerk verify the postage is correct. weight, a great bathroom scale is especially important when we’re on a specific eating habits or exercise program. In the least expensive class you have canvases of high concentration polymers. anyone. A stone restoration professional can restore the polish. preventing the pet from feeling separation anxiety when left alone. those hard to shop for pets and pet lovers on your list. Wearing nice clothes is an addiction for an extensive majority of women. Your choice of clothing from the style, brand, cut and price eventually depends upon your personality, resources, and the insight for fashion and style. These blazers can be very much suitable both as normal sized wearing and also as plus size clothing. Like the big bird, you could stick your head in the proverbial sand, say nothing and hope for the best. You should really take pleasure in such clothes if you are residing in the US. face looks very long and thin, you would want to be make it look more round and balanced, right. males in addition to children. Your lab imported it from New Zealand and has found the greatest deer antler velvet extract. The more clear and pure a diamond and more is its cost. wide-open field that is rarely tapped by photographers. Quartz is very famous among many jewellery wearers. A Diamond is a girl’s best friends – this isprobably one of the oldest sayings on Earth. must cram as many of them as possible into your content. cubes, oval, teardrop, and rice and twisted. They are often matched with colored or plain crystal beads. It is a fact the chunky Celtic designs do look good, but they can drill a hole in your pocket too. the things you need to be looking for in your stones are the colour, this should be clear and deep and have no imperfections. wedding as they can be perfectly matched with the wedding colour scheme. be confused with your thoughts and the items you see in the shop. proven for decades, Botox has without any unwanted side effects. I realized I needed a bottom for your molding of the deer. hours. Some discomfort may be present, but usually analgesics like Tylenol or codeine will help. ” Powerfully elevated in the area to the assistance of energy storing plans, your budget amongst Beijing (12. ‘ You should be regularly employed with a minimum salary of at least 1000 pounds per month or should have a proof of the capability to repay the amount. Harvard-educated Blumberg has represented the US and Canada at international squash and is also a keen photographer. The mobile supports both 2G GSM and 3G HSDPA network and a browser WAP 2.
adapter and it will be charged right away. Hello everyone, it’s my first visit at this web site, and paragraph is truly fruitful in favor of me, keep up posting such articles. the apps could have been rearranged about the home screen. February 5, 2016 - 12:36 am Pingback: Today’s Workplace » What Is “Economic Freedom,” And Who Is It For? Ok. So the article said, rising inequality will result in higher social unrest, protectionism, economic, social, political problems. Fact check. Isnt the nordic countries and other welfare state in Europe these days struggling to support their overly generous system? Isnt the whole western world who supposedly have lower income inequalities are suffering from pathetic economic growth. Isnt the western politics in a chaos, especially Europe. Isnt Europe and America moving towards a protectionist economy, such as Trump, Marine le Pen, Brexit and so on. And isnt it the west who overly loud about immigration issues lately. Sorry, even if Singapore income inequality is way higher I would rather live in Singapore then the west. True, we have a low tax rate. But white people just dont understand, you cant make the poor richer, if you dont make the rich richer. The rich and the poor both needed each other. Taxing them 50% of their income is just ridiculous. There are too many politicians these days who would rather do the popular thing to do rather then doing the tight thing to do.